*Long-term commitment to efficient and effective expenditure of all AIRO resources. with instructions on assembly, care and use in both English and Bahasa Indonesia. to activate 35 “keramba” (Indonesian) fishing rigs in the Port of Malahayati. disaster, rendering the 35 surviving “keramba” boats inoperable, as both are needed to fish. 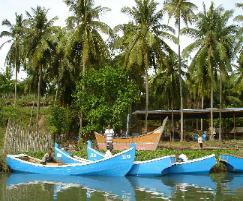 be replicated and expanded in tsunami affected fishing villages throughout the Western coast of Sumatra, Indonesia. Vice Panglima Laut, Razali Abdulah. Also identified: local crew of nine: one additional highly skilled craftsman, five apprentices, and three laborers. supporting the labor costs, and will maintain onsite management in Krueng Raya through the duration of the project. Land: Currently cleared; UNDP tents and small permanent work structures being erected. team of local experienced boat builders is directed by a master craftsman and supported with direct training from the UN FAO. also requires a 10x20 meter boat building shed, an 8x4 meter wood drying rack and a full set of power and hand tools. all of Aceh Province and just next-door to AIRO Big Fish Headquarters in Prunayong, Banda Aceh. This project also involved the fabrication of six, 1200-meter x 80-meter “Purse Seine” fishing nets for large fishing vessels in and around Lampulo. AIRO partnered up with Keuhne+Nagel shipping, a very large German shipping company, to provide the Island of Pulu Nasi with 7 AIRO INS-10 boats. the economy of the small Island of Pulu Nasi. Fourteen island families now have a real means for long-term sustainable livelihood recovery. Raya and build along side Pak Marzuki. permanent well was also installed on the AIRO KR worksite. being built anywhere in Indonesia!